Greetings from Sabreland! I, Mackintosh, am your newest Puckbuddys contributor and Buffalo Sabres correspondent extraordinaire. A couple of years ago, the boys of HSBC Arena and I found each other, and it’s been something of a schmoozefest ever since. Now, at this point, you might be thinking “a couple- as in two?” Well, yes. You see, I didn’t grow up a hockey fan. In fact, about 5 years ago, hockey was about as important to me as Derek Roy’s Twitter . Then, in my junior year of high school, I moved from the college sports-obsessed city of Louisville, Ky. to Western New York. I watched the 2010 playoff series against those goons from Boston the Bruins with a newfound fascination I had never before experienced in the sports world. The 2010-11 season sealed the deal for me – I was officially, undeniably a hockey fan, hopelessly in love with all of the glorious action that takes place on a 200′ x 85′ sheet of ice. Since that time, I’ve been to 9 NHL games (including one in Vancouver, our league cousins and my long-distance inamorato.) 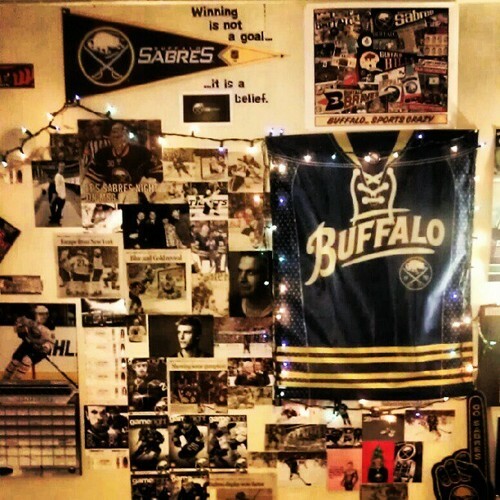 My apartment is decked out in enough Sabres flair to qualify for “Hoarders: Hockey Edition.” Rick Jeanneret announces my text messages, and anyone within a block’s radius knows when a goal is scored, because the magnificent, winsome sound known as the Sabres goal horn pumps through the stereo speakers at full volume. I’ve also recently forked over $200 to the “Blue and Gold Club,” i.e. the season ticket holder waiting list. It’s 2,800 deep and I’m bringing up the caboose, so hopefully in 5-7 years I’ll receive that heavenly phone call. Until then, tickets will be had by haggling with Craigslisters during class the day before games. Of course, I still have much to learn. Though I’ve grasped many of the finer details of the game, there are still some things I could understand better (i.e. why this warrants the wrath of the Shanahammer and this doesn’t… anyone?) I’ll also be spending the first half of this season studying abroad in Scotland, so I’m hoping to provide somewhat of an insight to what following a team from another country (no Canada, I’m not talking about you this time) is like. In closing – simply put, I love this sport. There’s nothing else quite like it, the speed, the agility, the skill, and yes, the fact that so many of our players are so ravishingly good-looking. And by that, I mean Tyler Myers. With the “You Can Play” movement rapidly becoming a mainstay of League culture among players and fans, what’s not to love? Editor’s Note: We came across Mac, a journalism major entering his senior year at Buffalo State College, not too long ago after seeing an op-ed that he wrote and placed in the Buffalo News, on You Can Play. It was love (and respect) at first sight. Give it a read. This entry was posted in Buffalo Sabres and tagged Buffalo Sabres, Derek Roy, Rick Jeanneret, Tyler Myers, who says hockey isn't gay?. Bookmark the permalink. Welcome to our crazy, lovable family! i am usually in Europe or UK during playoffs and watch live streaming Sabres using ESPN Player, which is only available in Europe. If you want to watch live you have to stay up all nite but it is worth it. Or you can watch tape. You were a high school junior when you discovered hockey and the Sabres. I was a high school junior when the Sabres played their first NHL season (1970-71). You had to get used to a new sport. I had to get used to a new rival for my affections. I’d been a fan of the AHL Bisons, of course, but my first love was the New York Rangers with the GAG line, the Cat, the Chief, etc; now my hometown had its own NHL club with the French Connection, Punch, Schoeny, etc. It was a painful separation, but eventually I divorced my Broadway Blueshirts. 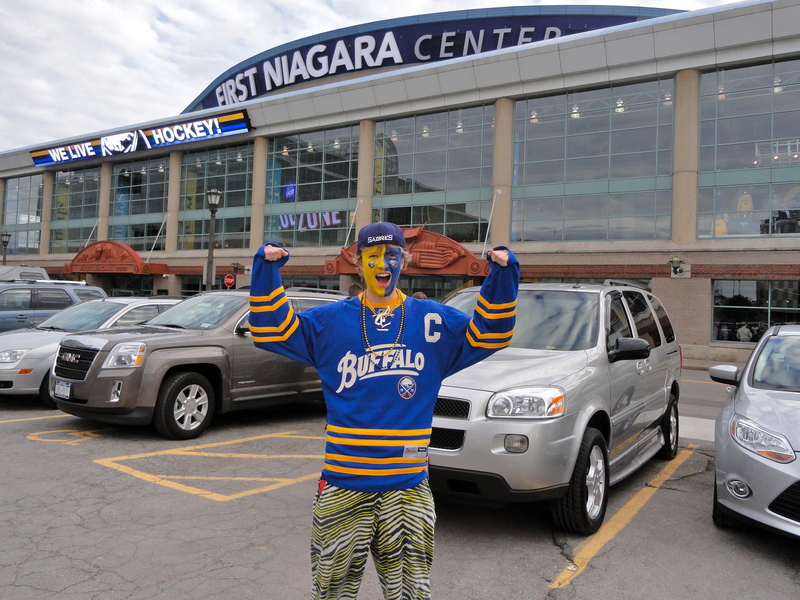 I also endured a long-distance relationship when the Sabres played in the Cup final while I was in the Army in Germany. I had to listen to the games on the radio at 2 a.m. 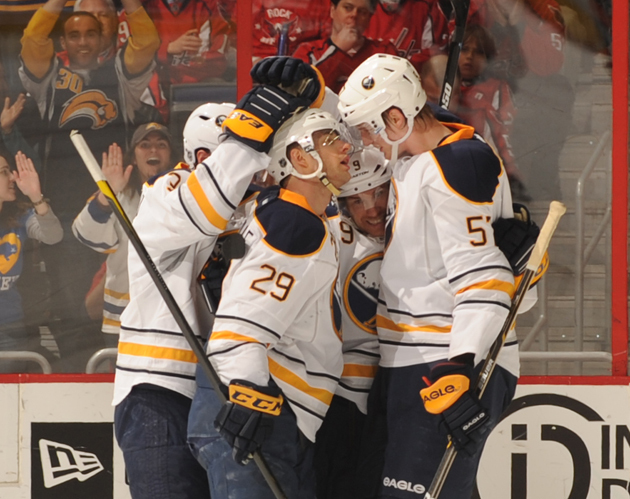 I hope the Sabres bring all of us much job this season.